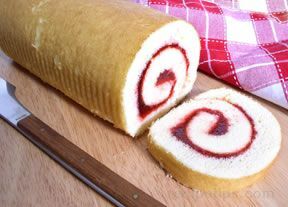 Prepare jelly roll pan with no stick spray. Line pan with wax paper which has been greased and floured. In a medium bowl, beat the eggs with electric mixer approximately 3-4 minutes. Slowly add the sugar while mixing. Beat in water and vanilla. Gradually add flour,* baking powder and salt. Beat until smooth. Pour evenly into prepared pan. Bake 12-15 minutes. Loosen edges of cake with a knife. Immediately after removing pan from oven, place a towel that has been dusted with powdered sugar over the top of the jelly roll. Turn the pan upside down on the towel. Carefully remove wax paper. While still hot, roll cake tightly. Cool thoroughly. Then, unroll cake and remove towel. 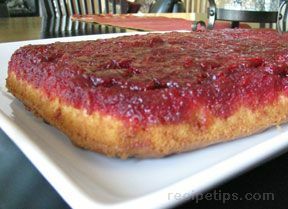 In a bowl, beat jelly thoroughly and spread over entire cake. Roll up cake and dust with powdered sugar. Cover and chill overnight. Slice and garnish if desired. *If making a chocolate jelly roll, add cocoa with the flour mixture.